Support our campaign to cut off funds to hate groups for good! White supremacists are rallying in Washington, D.C. right now. Their hatred and violence are on the rise. The number of murders carried out by white supremacists more than doubled last year. We need to stop the flow of money that keeps these groups going. 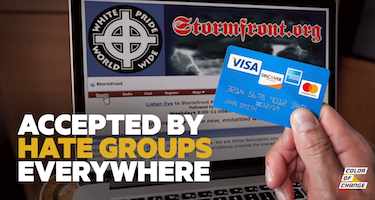 Donate now to our campaign to pressure Amazon, Discover and other payment processors to cut off these hate groups! We're already starting to win: Jason Kessler, organizer of the August 12 white supremacist rally on the anniversary of Charlottesville, has been kicked off PayPal. He's been stuck waiting for people to send him cash and checks in the mail. But companies like Amazon, Discover, Visa and American Express continue to process donations and sell merchandise for these hate groups. Since the white supremacist terrorism in Charlottesville last year, we have pushed companies like PayPal and MasterCard to remove more than 150 funding sources from hate groups. Invest today in our work to finish our campaign to cut hate groups off and end the flow of Blood Money!